Davie McPhail has supplied us with a article for the April issue of Hatches. I love the rustic appeal to these flies. These guys were making beautiful flies for fish. They have a practical beauty similar to today's hairwing flies - the perfect blend of art and utility. It was a great treat to see these flies up front and to have the chance to record them on camera for everyone to see. I totally agree with you, that's why I had to take photos of them so we at least could see the quality of the flies and the style of the tyings. I would have loved to have known who tyed them. Hi Mark, Having confidence in your flies is very important it will always catch you more fish than having none without. Thank you, Davie. The mounting was quite difficult to figure out to keep the flies from having to rest on anything, giving me the ability to show them off three-dimensionally and authentically. I have to give credit where credit is due, though: A custom-jeweler friend of mine named An Nguyen first got me thinking about displaying my flies via a leader of some kind, to free the fly (especially the hookpoint, which is usually buried in a piece of wood or plastic) and allow it to be viewed from all angles. A second gentleman, James Thurman, a metallurgical artist at Penn State, gave me the ingenious idea of weaving the leader over a supporting wire. I still had to work out all the practical difficulties, but without the contribution of those two men I would almost certainly not be displaying my flies this way. I am indebted to a lot of people. By the way, I saw your website as well, and I want to tell you how much I also enjoyed your flies. You have technical skill that is truly amazing, and you also have a great eye for combining colors and patterns. I'm impressed by how many diverse materials you have on some of your flies while maintaining a cohesive vision for the finished fly - a rare gift, indeed. Those pictures are spectacular! I'm thinking of buying a lamination unit so I can laminate all the articles and images I want to save. I've got a stack at the clinic. This article (how much text is there in addition to the pictures?) will be in the stack, too. There's so much good stuff to read, enjoy and read again. This first fly is my favorite of the 70, and there are some stunners in there! Has anyone taken the time to write down a recipe for any of these? I can make out most of the materials in McPhail's Old No.1 (for lack of a better name), but can't make out the forward half of the body (presume pigs wool, but what color(s)? ), and see some orange fibers in the throat, but perhaps only one wrap of that feather. Body:	(In quarters? ), Claret, Blue, ?, ? Davie, Thanks for sharing this treasure of historic flies. Surely it's plainly obvious this is a Butcher Mr White????? my first thought...what a pretty old butcher. the gut is still knotted on..i can't get a good look at it what kind of knot is it? Wow, that butcher looks really fishy! I would love to know how many fish have decided to eat that fly. 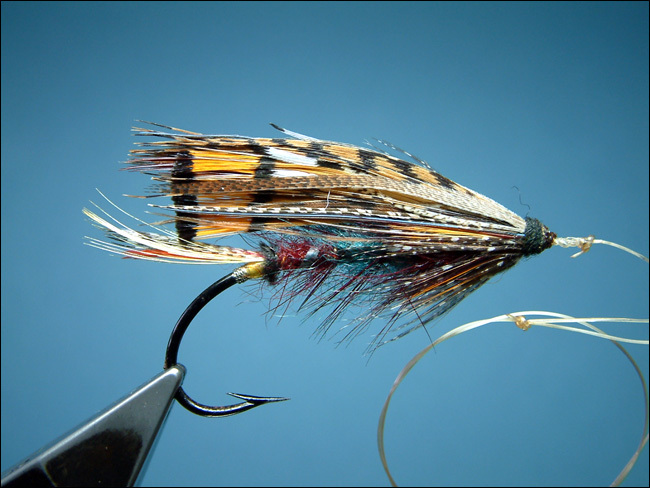 thanks for the post, it definetly inspired me to start fishing some full drees flies.